Hometown: The graveyard on the outskirts of town. Education: Majored in Biology and Anatomy at Cartilage College in Kenosha, Wisconsin. I would have loved to get my Doctorate, but I didn’t have the…guts. Position: Model, prop, and part-time coat-rack. Describe some of your job duties: I have a variety of job duties. 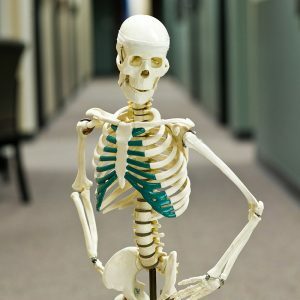 I greet guests as they enter the clinic, teach patients about joints and the skeletal structure, and help explain procedures to clients by modeling my own bones. Basically, I hang out by Nurse Golla’s desk and help in any way that I can. Favorite thing about working at KC: I really enjoy working with people. Working at Klasinski Clinic really keeps me on my metatarsals. I also enjoy being a resource for patients and my colleges— No “body” can do what I do for Klasinski Clinic. Hobbies: I love telling jokes. My coworkers are always telling me how humerus I am! Family/Pets: I have a French bulldog named Napoleon Bone-apart. We get along well, though he does occasionally attempt to chew on my femur when he gets upset with me. If you could be any office supply item, what would you be? I think I would make a good office fan, because I’ve been told the wind blows right through me.